LinkExchange SearchMe WhatWeDo AboutUs Sitemap Next page Equipment to fill a box storage. Equipment to fill a box storage. Filling a bulk storage with tipper trucks. 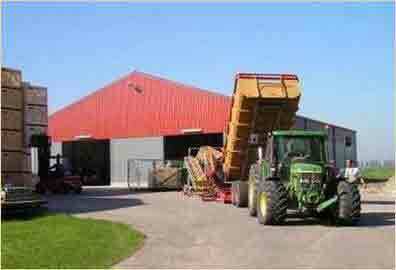 Equipment needed to fill a 10.000 Ton bulk storage for potatoes or onions. 1. 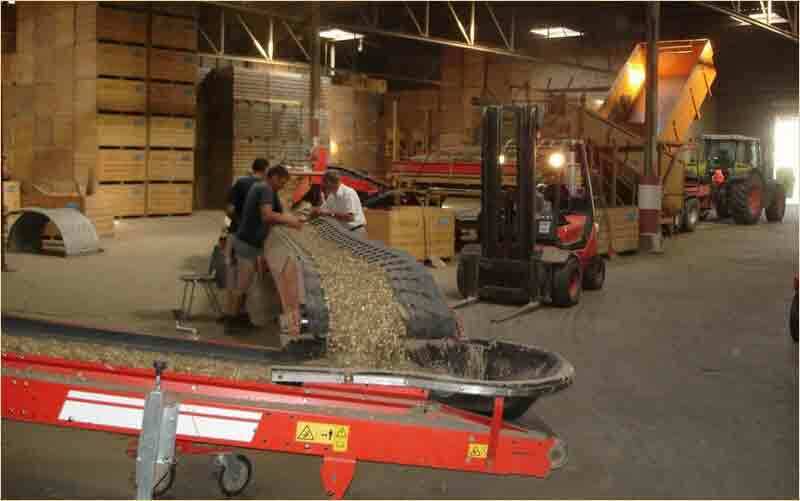 Receiving hopper with pre-cleaner; The harvested potatoes or onions come in tipper trucks or dumb carts. The product is dumped into the hopper, at the outlet of the hopper is a pre-cleaner. This pre-cleaner has vibrating bars to separate soil and other unwanted inclusions from the product. 2. Telescopic conveyor belts; Telescopic conveyor belts are needed, because the reception hopper cannot be moved all the time, but the product has to get at the correct location in the storage. 3. Piler; Is an elevator that con move up/down, left/right and forward/backward. It piles the product onto the product heap constantly moving not to form cones within the product. These product cones inside a heap of onions or potatoes will inhibit homogenous ventilation. Product arriving from the field at the bulk storage in tipper cart. 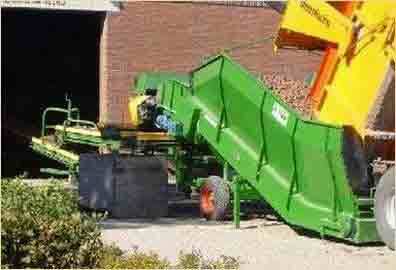 The product is dumped into the receiving hopper and passes over a pre-cleaner. Receiving potatoes. The wooden box receives the waste from the pre-cleaner. These three man are the only people involved in the operation of filling this bulk storage. The fourth man in the tractor works for the farmer. He brings the product from the field to the storage. Totally automated filling-station. The coordinates of the bulk storage are put into the equipment's computer and with the help of GPS the bulk piler fills the bulk storage. The process is completely automated. Birds view of a fully automated bulk storage filling system. Next up: Equipment to fill a box storage. set of telescopic conveyor belts to the bulk piler. Really sophisticated storage facilities have this systems completely automated. By putting the GPS coordinates of the storage chamber into the system's computer and then the conveyor belts together with the piler move around autonomous and pile the bulk crop neatly and evenly spread in the storage chamber.